I am having a ‘fat day’. And you do not want to mess with a single gay man in his mid-30s having a ‘fat day’, ok? 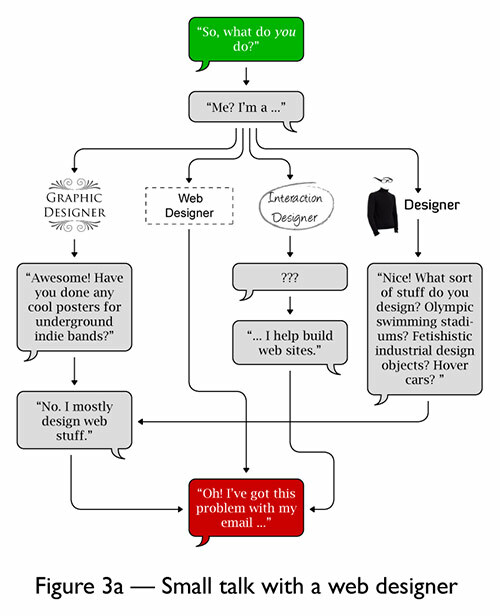 From swissmiss comes this great flowchart to help some people understand what it’s like to tell people you work in web-related design. Replace that last box with, “Oh! Can you help me build a website?” and it’s much closer to my personal experience. Or a 41 year old single gay man. This made me laugh despite still feeling like chewed gum. I can’t use this excuse, since every day is a fat day for me. Plus, I’m a 47-year-old single gay man. Thank God for cats. Still, the wording is priceless. Like cable-tv-show worthy. When are you going to submit your treatment to USA?